Considering the ever-increasing pace of life in big cities, sometimes it can be easy to lose oneself in overwhelming routine. Being in a hurry all the time, a regular citizen may have no time for satisfying even basic needs such as sleep and nutrition. This is probably why seeing sleeping people in public transport is so common, and why fast food restaurants are crowded all the time. Sleep deprivation in big cities is a well-known problem, and people are gradually becoming more aware of the importance of sleep. In the case of fast food, however, things are not that simple. Even though the majority of people know about the dangers of eating food from McDonald’s, Burger King, Subway, and similar places, they still go there. The factors causing such behavior should be analyzed separately. Instead, this paper focuses on the reasons why you should quit eating fast food as soon as possible. The most obvious reason everyone is aware of is the increased risk of developing obesity. Sometimes, being overweight is caused by health problems or psychological issues. However, much more often, becoming overweight is evoked by dysfunctional eating habits and the regular consumption of fast food. According to research, people eating fast food regularly develop much higher risks of gaining extra weight. They are also more likely to develop type 2 diabetes. Unfortunately, not only adults are exposed to these risks–teenagers and children are also under threat. Throughout the last 30 years, the rates of adolescent obesity have tripled. For children, this index has doubled over the same period of time. This might be related to sophisticated advertising, but facts remain facts: fast food leads to obesity, and all age groups are at risk (Lifehack). Unlike organic food, which is by default created from pure, natural ingredients, fast food often has a bunch of dubious ingredients in it. To start with, all kinds of flavor enhancers are added into it so that it tastes and smells better. Conservatives and food preservatives may be used as well–in particular, tertiary butylhydroquinone, which is made from similar ingredients as petroleum. As if this was not enough, fast food may contain the remainders of drugs and antibiotics. How do they get in there? The good news is that fast food does contain real meat. The bad news is that animals are kept in such awful conditions that they often suffer from a number of diseases. To deal with this problem, fast food manufacturers may add antibiotics to animals’ nutrition–later, they can get into your body when you eat your next chicken burger (SheKnows). Along with the risks of developing obesity and pumping your body with doubtful chemicals, eating fast food often means exposing almost every organ of your body to dangers. For example, it becomes much easier to get kidney diseases: because fast food is often salty and greasy, it increases blood pressure, makes you want to drink all kinds of soda drinks (which are unhealthy in their own way), and affects kidneys adversely. Besides, due to high amounts of cholesterol and triglyceride contained in fast food, your cardiovascular system suffers as well. This is not to mention the fact that processed fats in fries and other junk food, when supplied to the brain instead of nutrition, affect cognitive abilities in a negative way. In particular, according to research conducted on rats, a week of daily fast food consumption caused memory impairment in test subjects. And, as if this was not enough, junk food increases your chances to get cancer (Beauty and Tips). As it can be seen, cheap and tasty food is not what your body needs. 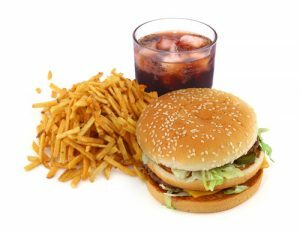 To start with, when eating fast food regularly, you put yourself (or your children, if you tolerate their fast food habits) at risk of developing obesity, and possibly type 2 diabetes. Some crucial organs of your body such as kidneys, heart, and brain, suffer from junk food immensely. And, if adverse health effects are not enough for you, think about preservatives, antibiotics, and other chemicals you stuff your body with when eating fast food. Christ, Scott. “Stop Eating Fast Food: Why Fast Food Is Slowly Killing You.” Lifehack, Lifehack, 20 Feb. 2014, www.lifehack.org/articles/lifestyle/stop-eating-fast-food-why-fast-food-slowly-killing-you.html. Gallam, Claire. “Cheap and Easy Fast Food Meals Are Tempting, but Are They Really Worth It?” SheKnows, 13 Jan. 2017, www.sheknows.com/food-and-recipes/articles/961233/top-10-reasons-not-to-eat-fast-food. “10 Strong Reasons to Stop Eating Fast Food.” Beauty and Tips, www.beautyandtips.com/healthy-eating/10-strong-reasons-to-stop-eating-fast-food/.